In this technical script, highlights of the Sending and Receiving Outlook Error 0x800ccc0f have been explained. I have provided all the information on how to tackle this error along with the possible reasons behind this error. Outlook error code 0x800ccc0f is an error in MS Outlook which arises when a user sends or receives an email. A long message is displayed indicating about the error. This message can easily be understood by the tech geeks but for the users who are not technically sound, it is a pathetic situation. The following error message is displayed on the screen indicating the occurrence of Outlook error code 0x800ccc0f. Some technical issue with the server settings. Issues with the internet connectivity or the Exchange Server. Firewall blocking MS Outlook outgoing and incoming messages. Corruption in Outlook profile or Incorrect settings of Outlook profile. 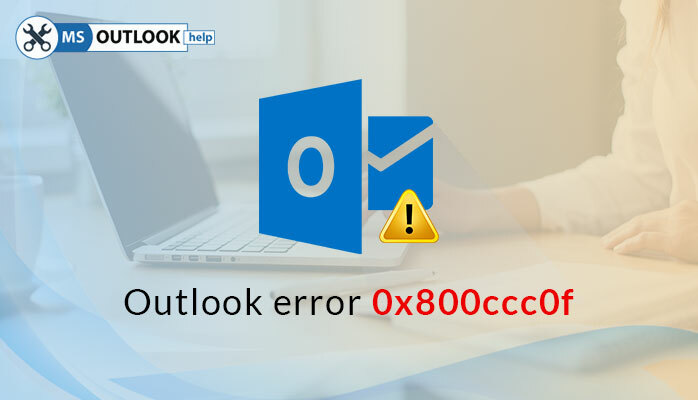 Send or receive the emails to ensure that the Outlook error 0x800ccc0f has been fixed or not after applying the above fixes. At first, be sure that your system has been connected with the internet and is able to send/receive the email messages. In the browser, type any website’s URL. If the website is opening, your system has access to internet connection. If it doesn’t open, troubleshoot the problems in network connectivity by right-clicking on the Wifi signal or Ethernet cable connection and further on “Troubleshoot Problems” in the pop-up menu. At last, move to the ‘Security’ tab and switch off the Firewall. After that, you need to add manually the outgoing SMTP server name and incoming POP server name in the Outlook email account. Go through the below path for doing this. Launch the Outlook and go to Tools ⇒ Email Accounts ⇒ View or change existing email accounts ⇒ Next. Click on Add option under the email accounts dialog box. Now, click on POP3 and then Next button. Enter the exact information of your POP3 mail server. Further hit a click on Next and then on Finish. At last, rectify the settings of the Outlook account. For each of the Outlook versions, there are certain differences in the settings of Outlook profile. So, it should not be done in a casual way. It is wise to exercise the caution before you apply and changes to it. A minor mistake may lead to the corruption in the data. So, it should be done with utmost care. Go to ‘Start’ menu. Open the Search box and type outlook.exe /safe in it and click OK. For the Outlook 2003 and earlier versions, you’ll have to type this in the Run dialog box. If none of the above methods are effective to fix the Outlook send/receive error 0x800ccc0f, there is a possibility that the actual problem is with the OST file or PST file. There might be a corruption in these files. To resolve this issue, you can utilise the Microsoft’s inbuilt inbox repair tool i.e. ScanOST.exe or ScanPST.exe. Just locate these utilities and run them one after the another. You can do it by just specifying the OST and PST files that the Outlook profile is using currently. All the solutions that have been explained above are good to go but there might be some limitations between them. You need to maintain the utmost care while performing these manual solutions. If, due to mistake your Outlook profile have been deleted or damaged, it will end up with the loss of data. To get rid of the above issues, it is recommended to export all the data in OST file format to Outlook PST. It can be done effectively by simply employing an OST to PST Converter. It is one of the most reliable and efficient software utility that can be used for this OST to Outlook PST Conversion and further to troubleshoot the Outlook error 0x800ccc0f.